Tyler Mallari AKA @themuslimmale is back with another article, this time covering the top clothing essentials for the winter season. With all the hustle and bustle of the holiday season coming to a close, our brothers in style have been busy scouring the net and their local shops for deals on the hottest winter styles. Though we’ve all probably got a few key pieces on our mind already, we at Bahath and The Muslim Male wanted to share our top picks for the winter season which we feel are perfect for the modern Muslim dude. Feel free to comment and share with us your own winter staples! Originally developed to keep the heads of seafaring men nice and snug, these knit beanies have become more prominent on the streets than on the seas, featured on the heads of celebrities and streetwear enthusiasts alike. For the average Muslim dude, trudging through icy winds and even snow and arriving at perhaps a similarly chilly mosque is never a fun experience and what we personally love about these beanies is that they double as both everyday wear and a stylish, yet nearly identical, alternative to the kufi. For those brothers who are looking to change up their look without bothering about changing between “work appropriate” and “Islamic” headwear, look no further! These beanies are best found online or in store for quite cheap through popular fast fashion sellers such as ASOS, H&M and Forever 21 and are available in colours suitable to literally any wardrobe. For a sleek and understated look, try pairing a black beanie with a long black overcoat, a plain sweater in white, black, grey or a muted colour and a clean pair of minimal trainers like Adidas Superstars. 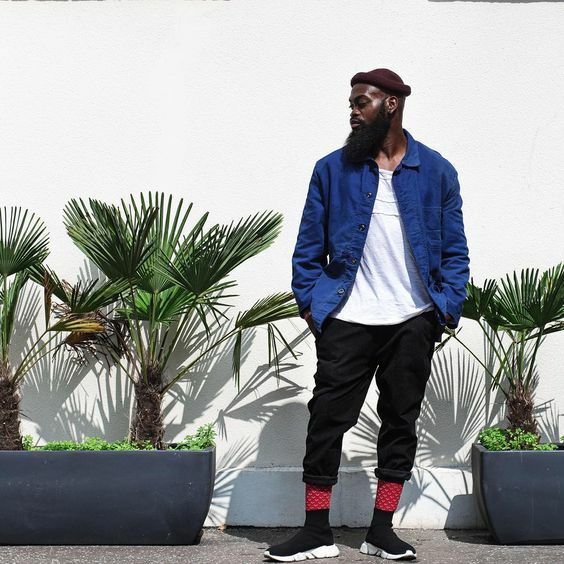 For an edgier look, try a colourful beanie with a field or bomber jacket with torn, light denim and your favourite boots or high-cut sneakers. Finally, for a modern twist on traditional, try a muted beanie with a slim-cut kurta over slim, cropped chinos and penny loafers. A staple for modern officewear, the overcoat is an instantly slimming winter option that will set you apart easily from the average unshapen parka -wearing businessman as well as the slew of youth adorned with bomber jackets. Overcoats are definitely investment pieces and therefore should be shopped for carefully. Keep in mind that since these are designed to fit your suit jacket under, the size of your overcoat should be one size larger (i.e. if you wear a size 38 jacket, your overcoat should be size 40). Key details to look for in a quality overcoat include a slim but not suffocating cut, high armholes and quality stitching. Though these are typically meant to be worn over formal or business casual wear, they also look fantastic over casual and traditional wear, hence being a perfect piece for a minimal or capsule wardrobe. For a casual look, try pairing a camel overcoat with a white, black or grey sweater, grey slacks and minimal sneakers. For a polished traditional look, try one in navy over a tailored white or black thobe, finished off with black oxfords or tassel loafers. The same can be achieved with a white or black kurta with matching shalwar or churidar. 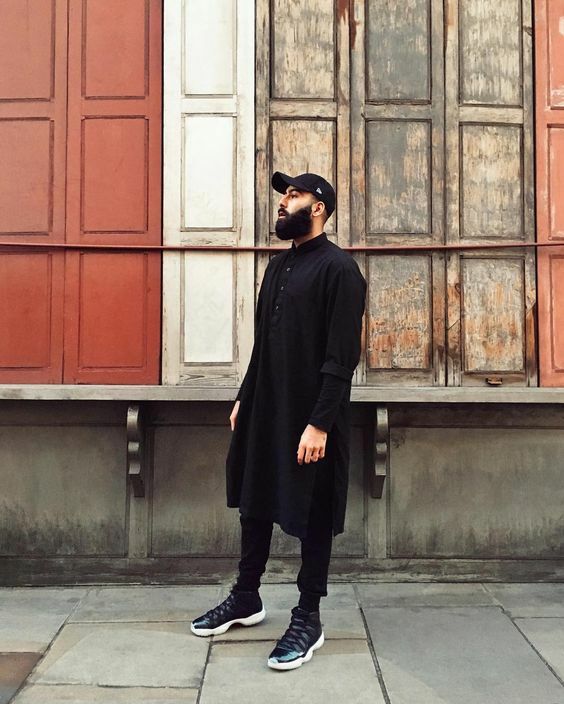 Perhaps the most stereotypically “Muslim” of all the modern trends we’ve seen, the longline trend, featuring tees, shirts, sweaters and even coats in extended lengths, is still going strong and offers a vast array of pieces that can be used as alternatives to thobes and kurtas. This season, we recommend longline sweaters, whether in crewneck, v-neck, cardigan or hoodie form, primarily as pieces which add an interesting middle layer or as statements on their own. ASOS stocks these in several styles and H&M typically has at least a couple sweater styles cut in longline during the colder months. When styling longline sweaters, keep in mind that the drape of the sweater should be the main point of interest for the outfit, with colors, accessories and other layers being made simple in order to prevent visual confusion. Tried and true, dark denim is perhaps the most versatile of all menswear bottoms and can be mixed in with outfits that are sporty, rugged, classic, polished and all in between. These pieces are widely available both in stores and online and quality pairs can be found in any price range. As with shopping for any jeans, inspect the quality of the seam stitching and ideally avoid any embellishing or fraying in order to maintain dark denim’s understated elegance. Additionally, look for between 2-3% spandex in the material for a fit that feels as comfortable as your track bottoms. For a workwear look, pair with a beanie, dark denim jacket, thick crewneck sweater and either cargo pants or denim in a different dark shade. 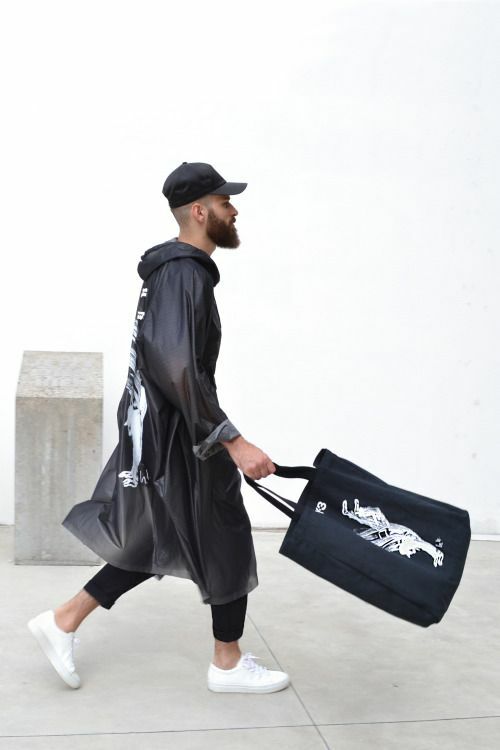 For a streetwear look, wear with a ballcap, bomber jacket, longline shirt or sweater and relaxed light or dark denim. A favourite for our brothers on the East Coast of the U.S., Timbs have been winter spales for streetwear enthusiasts since the early 2000s. Since these are statement pieces, especially in their trademark wheat shade, and at best casual footwear to be worn to social gatherings, Timbs are best suited to workwear or streetwear-inspired looks and should never be mixed in with formal or even smart casual wear unless snow levels are truly impassable otherwise. For those of you who aren’t quite a fan of the wheat shade, Timbs are also available in shades of brown, grey, black and even green!